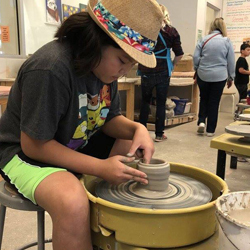 Parent and child will spend two sessions learning handbuilding techniques (including pinch, coil and slab construction) then two days learning wheel throwing. One class period will be spent learning to combine wheel thrown forms with hand built decorations. The last day will be spent glazing the pieces made during the class. Pieces can be picked up two weeks after the class ends. For children 6 and up and parent and child must each register.